Jules Bianchi made his F1 debut with Marussia after being in the frame for the Force India seat in 2013 until the very last moment. Instead, he drove for the backmarker squad but still impressed with his pace at the rear of the field. For 2014, he was retained at Marussia but was involved in an horrific crash at Japan, when the car crashed into a recovery vehicle. Sadly, the Frenchman did not recover from his injuries, passing away in July 2015. Jules Bianchi already had some motorsport in his veins, as his grandfather was a GT World Champion, and his grandfather’s brother participated in some Formula One races in the 1960s. Making his way through the traditional karting route, Bianchi moved up to the French Formula Renault series, taking the championship in 2007. At the end of the year, he was signed to ART for a Formula Three Euro Series seat, where he remained for the next three years. In 2010, Bianchi graduated to ART’s GP2 team, securing pole positions and points finishes in his first season. That year was mired by a big crash in Hungary, where he fractured a vertebrae, but Bianchi was well enough to drive in the next race. He continued racing for ART through 2011, and then made the unusual switch to Formula Renault 3.5 for the 2012 season. Bianchi fought for the championship against Robin Frijns and eventually ended the year in second place. As part of the Ferrari junior driver programme, Bianchi’s name was briefly in the frame as a substitute for Felipe Massa after his F1 crash in 2009. The Frenchman instead remained a test driver – participating in young driver tests for Ferrari and being signed as reserve driver for the 2011 season. In 2012, Bianchi was loaned as a test driver to Force India who then considered him for their 2013 line-up. The decision came very late, just before the season was about to start, and Force Indi opted not to include Bianchi in the line-up. Instead, he was signed to Marussia after they abruptly tore up their contract with Luiz Razia. Despite having such a short time to acclimatise, Bianchi performed well in the first half of his debut F1 season. He impressed the bosses with his attitude and pace, and Jules regularly outperformed teammate Max Chilton. At the end of the year, Marussia announced Bianchi would be staying with them for the 2014 season, giving him far more notice than they had for 2013. Bianchi continued to shine during the 2014 season, and the Marussia team embarked on huge celebrations after he picked up their, and his, first points in Formula One at Monaco. Sadly, Bianchi was unable to finish the season after sustaining a serious head injury after a crash at the Japanese Grand Prix. He was taken to hospital in Japan, and later moved home to France, where he remained unconscious. Sadly, in July 2015, the family confirmed that Jules had succumbed to his injuries. The funeral was held at Nice Cathedral, and was well attended by his fellow F1 drivers and friends. FIA President, Jean Todt, confirmed that Bianchi's driver number would be retired from use as a tribute. Learn more about Jules Bianchi with the Pocket F1 Handbook. 24/04/2017 The Great Debates - How safe is too safe? Marussia are running just one car this weekend, with Max Chliton their representative in Russia. 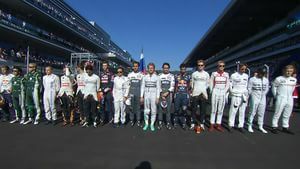 It's their home race, but they're paying tribute to Jules Bianchi who remains in a critical condition in a Japanese hospital. Everyone is thinking about the Frenchman and his family. Safety car has been called for. The medical car has also been deployed apparently to attend to Jules Bianchi who went off somewhere near the Sutil incident. More of the top runners come into the pit lane. Mercedes haven't pitted, and neither has Jules Bianchi who is now running third!